I’ve been an avid boardgamer for many years now, I built up quite a large collection (before I had kids!) and I even attended Spiel in Essen, Germany, the largest trade fair for toys and games. It’s been a hobby that I couldn’t wait to share with my children one day, and I’m happy that Amy is old enough to join us in a few boardgames now. Hasbro has an incredible range of boardgames that have been created for children to enjoy, and its great way to spend time together with your kids while learning and having fun! 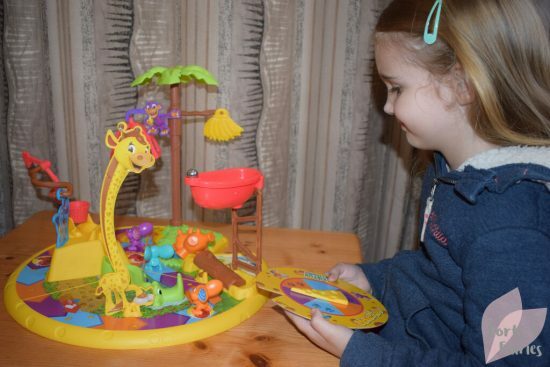 Elefun & Friends Mouse Trap is a great starting point, it’s a simple concept that kids will grasp easily and it will introduce them to how entertaining boardgames can be. It’s recommended for ages 4 and up, but Amy who is now 3 was able to play together with us with a little bit of guidance. The game can be played with two to three players, so it’s perfect for Mom and Dad to enjoy with your little one, or for the little ones to team up and try to beat Mom or Dad! Older children will obviously be able to enjoy it together with their siblings or friends. Although it’s easy to set up (thanks to a detailed instruction pamphlet), it does require a little bit of time to assemble the pieces and you will need to help. But your kids will find this set up exciting as you build the course and the trap. It was just as easy to disassemble it and pop it back in the box when we were done. It stores compactly in the box and is simple to pack into your luggage if you’re heading away on holiday with the family, we took it away with us recently and enjoyed playing it on a rainy day. 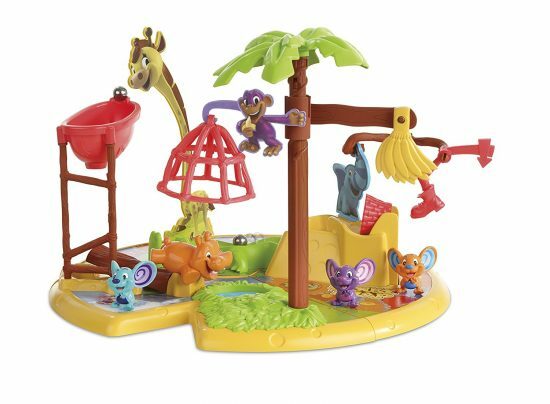 Each player can choose one of the three mouse figurines, you can choose to be Sneakers Mouse, Nacho Mouse or Pepper Mouse. You will then take turns spinning the cheese wedge and moving to that colour space on the board. If a player lands on a space with a boot and a mouse is in the cheesy trap area, they will be able to launch the mouse trap to try trap the opponent’s mouse. When you launch the trap you must of course yell “Mouse Trap!” Set off the trap by making the boot kick the bucket, this will cause the marble to run down the crocodile slide, push the giraffe forward which will in turn cause the next marble to fall into the tub, drop down onto the log and tip the hippo forward to push the pond and finally activate the trap on the tree which will twirl around and land on the board. If you trap the opponent’s mouse you win, but if not you can reset the trap and keep playing. It’s a quick game, and you’ll find yourself wanting to enjoy a few rounds together with your kids. Amy absolutely loved setting the trap off, as well as helping to reset it. She wasn’t so worried about winning as she was just getting ready to make the boot kick the bucket and set the trap off! 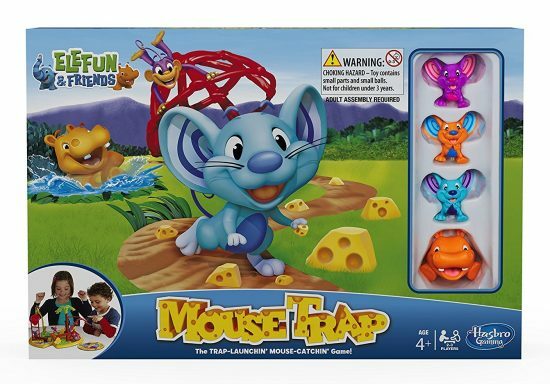 Elefun & Friends Mouse Trap is a great way to introduce your kiddies to the fun that boardgames can be. I foresee many more afternoons playing this game with my children, it’s a simple concept but one that younger kids will definitely enjoy. It’s available from toystores and online retailers for a recommended retail price of R350. Do you play boardgames with your children? What’s your favourite boardgame? Thanks to Hasbro for letting us pass the love of boardgames onto our children.